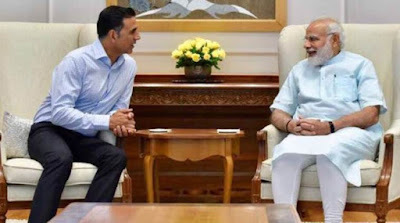 National Award winning actor #Akshay_Kumar on Tuesday put a smile on Prime Minister #Narendra_Modi's face with the title of his next film #Toilet_Ek_Prem_Katha. He tweeted: "Met PM Narendra Modi and got the opportunity to tell him about my upcoming 'Toilet-Ek Prem Katha'. His smile at just the title made my day," the actor wrote along with a photograph featuring him engrossed in conversation with Modi. It was earlier said that the film was based on Modi's Swachh Bharat Abhiyan. But the film's dialogue writers Siddharth Singh and Garima Wahal told that the movie was conceptualised much before Modi became the PM.